Today, I met with one of my third grade book clubs. They are my youngest readers and we are still getting to know each other, not to mention how to approach book club. One of my goals with the readers in my groups is to help them learn to "read between the lines." It doesn't take my readers long to figure out that when I ask them, "What is the book about?" I am not interested in plot points. Because I work with 3-8th graders, we do begin with the plot, but the older the reader, the faster they can move to what a book is really about. Roald Dahl's novels are a great training ground. Think of Charlie and the Chocolate Factory. Even if you didn't get explicit information about the moral from the umpa lumpa's songs, you can come to understand the life lessons contained on its pages by the actions and attitudes of the children. Mikey loves TV so much he finds his way into the TV. Augustus loves food so much he falls into the river of chocolate. That darned gum chewer, Violet Beauregarde, just blows herself up! Now, I would guess, that these particular habits of children drove Mr. Dahl mad. But, I would further assert that he is reminding us that too much of anything is not great. Girl with a magic finger gets mad at her duck hunting neighbors. Girl points said finger at the neighbors, making them trade places with the ducks. Neighbors shrink and grow wings. Ducks grow and get guns. Ducks throw the humans out of the house and begin to hunt them down. The spell wears off in time and the characters are returned to their original bodies. Though they all look the same on the outside, they are changed on the inside. The Gregg family, the duck hunters, change their name to Egg and become advocates for ducks. When first asked what Roald Dahl means for us to learn from this novel, my youngest readers usually say, "He is against duck hunting!" Though this is possible, I have know idea what his ideas about hunting are, with a little pushing, it doesn't take them long to understand a bigger theme: we ought to think about how others feel. Or, Learn to walk in another mans shoes. 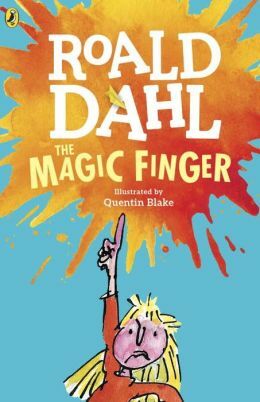 As with all of his novel, The Magic Finger offers the reader many new ways to think of themselves and new ways to live life. I highly recommend this book. It is only 64 pages and a great place for a new reader to discover this masterful writer on their own. Hello there, I found your website by the use of Google whilst searching for a related topic, your web site came up, it seems to be good. I’ve bookmarked it in my google bookmarks.